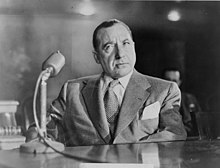 Mobster Frank Costello testifying before the Kefauver Committee. The United States Senate Special Committee to Investigate Crime in Interstate Commerce was a special committee of the United States Senate which existed from 1950 to 1951 and which investigated organized crime which crossed state borders in the United States. The committee became popularly known as the Kefauver Committee because of its chairman, Senator Estes Kefauver. Organized crime was the subject of a large number of widely read articles in several major newspapers and magazines in 1949. Several local "crime commissions" in major cities and states had also uncovered extensive corruption of the political process by organized crime. Many cities and states called for federal help in dealing with organized crime, yet federal law provided few tools for the U.S. government to do so. In particular, many cities and states were concerned with the way organized crime had infiltrated interstate commerce, and how it threatened to hold the American economy hostage through labor racketeering. On January 5, 1950, Senator Estes Kefauver (Tennessee) introduced a resolution that would allow the Senate Committee on the Judiciary to investigate organized crime's role in interstate commerce. However, the Senate Committee on Interstate and Foreign Commerce already claimed jurisdiction over the issue. A compromise resolution was substituted which established a special committee of five Senators, whose membership would be drawn from both the Judiciary and Commerce committees. Debate over the substitute resolution was bitter and partisan, and the voting on the resolution extremely close. On May 3, 1950, Vice President Alben W. Barkley, sitting in his role as President of the United States Senate, cast the tie-breaking vote, and the Special Committee to Investigate Crime in Interstate Commerce was established. Barkley, as President of the Senate, was empowered to choose the committee's members. They included: Kefauver; Herbert O'Conor (Maryland), Lester C. Hunt (Wyoming), Alexander Wiley (Wisconsin), and Charles W. Tobey (New Hampshire). Many of the Kefauver Committee's hearings were aimed at proving that a Sicilian-Italian organization based on strong family ties centrally controlled a vast organized crime conspiracy in the United States, but the committee never came close to justifying such a claim. Rather, the committee uncovered extensive evidence that people of all nationalities, ethnicities, and even religions operated locally controlled, loosely organized crime syndicates at the local level. The committee's final report, issued on April 17, 1951, included 22 recommendations for the federal government and seven recommendations for state and local authorities. Among its recommendations were: The creation of a "racket squad" within the United States Department of Justice; the establishment of a permanent Crime Commission at the federal level; the expansion of the jurisdiction of the Judiciary Committee to include interstate organized crime; federal studies into the sociology of crime; a ban on betting via radio, television, telegraph, and telephone; the establishment of state and local crime commissions; and a request that the Justice Department investigate and prosecute 33 named individuals as suspected leaders of organized crime in the United States. The committee's work led to several significant outcomes. Among the most notable was an admission by J. Edgar Hoover, Director of the Federal Bureau of Investigation, that a national organized crime syndicate did exist and that the FBI had done little about it. Legislative proposals and state ballot referenda legalizing gambling went down to defeat over the next few years due to revelations of organized crime's involvement in the gambling industry, and more than 70 "crime commissions" were established at the state and local level to build on the Kefauver Committee's work. The Kefauver Committee was the first to suggest that civil law be expanded and used to combat organized crime. Congress responded to the call, and in 1970 passed the Racketeer Influenced and Corrupt Organizations Act as a direct response to the committee's recommendation. Senator Kefauver served as the committee's first chair. Kefauver relinquished the committee chair on April 30, 1951, and Senator O'Conor assumed the chairmanship until the committee folded on September 1, 1951. The television broadcast of the committee's hearings attracted huge public interest and educated a broad audience about the issues of municipal corruption and organized crime. An estimated 30 million people in the United States tuned in to watch the live proceedings in March 1951 and at the time 72 percent of the population were familiar with the committee's work. The tremendous success of the broadcast led to the production of a cycle of "exposé" crime films dealing with the dismantling of complex criminal organizations by law enforcement. The first one of these was The Captive City (1952), which had the blessing of senator Kefauver himself: Director Robert Wise took a print of the film to D.C. to show the senator, who not only endorsed it but even appears in the prologue and epilogue, cautioning audiences about the evils of organized crime. Other notable examples of exposé films inspired by the hearings include Hoodlum Empire (1952) and The Turning Point (1952). A fictionalized version of the Senate hearings is a central plot device in the 1974 film The Godfather Part II, featuring testimony by Michael Corleone, now the head of his eponymous crime family, and disgruntled Family caporegime Frank Pentangeli. ^ a b c d Friedman, The Secret Histories: Hidden Truths That Challenged the Past and Changed the World, 2005, p. 151. ^ a b c d e f g h i j k "Records of Senate Select and Special Committees, 1789-1988," In Guide to Federal Records in the National Archives of the United States: Bicentennial Edition, National Archives and Records Administration, 1989. ^ a b c d e f g h i Thompson, Gambling in America: An Encyclopedia of History, Issues, and Society, 2001, p. 207. ^ a b c Shanty, Organized Crime: From Trafficking to Terrorism, 2008, p. 22. ^ a b c Larson and Garrett, Crime, Justice and Society, 2003, p. 152. ^ Hughes, Crime Wave: The Filmgoers' Guide to the Great Crime Movies, 2006, p. 147. ^ Fontenay, Estes Kefauver: A Biography, 1991, p. 171. ^ Kaiser, The Road to Dallas: The Assassination of John F. Kennedy, 2008, p. 12. ^ a b Beare, Critical Reflections on Transnational Organized Crime, Money Laundering, and Corruption, 2003, p. 19. ^ a b Batista, Civil RICO Practice Manual, 2008, p. 2–14. ^ Spicer, Andrew (2010). Historical Dictionary of Film Noir. Scarecrow Press. pp. 47–48. ISBN 978-0-8108-7378-0. ^ Dickos, Andrew (2002). Street with No Name: A History of the Classic American Film Noir. The University Press of Kentucky. pp. 203–206. ISBN 978-0813122434. ^ "The Captive City film article". at tcm.com. Retrieved 2014-08-22. ^ Larke-Walsh 2010, p. 151. Batista, Paul A. Civil RICO Practice Manual. Frederick, Md. : Aspen Publishers, 2008. Beare, Margaret E. Critical Reflections on Transnational Organized Crime, Money Laundering, and Corruption. Toronto: University of Toronto Press, 2003. Fontenay, Charles. Estes Kefauver: A Biography. Paperback ed. Knoxville, Tenn.: University of Tennessee Press, 1991. Friedman, John S. The Secret Histories: Hidden Truths That Challenged the Past and Changed the World. New York: Picador, 2005. Hughes, Howard. Crime Wave: The Filmgoers' Guide to the Great Crime Movies. London: Palgrave Macmillan, 2006. Kaiser, David E. The Road to Dallas: The Assassination of John F. Kennedy. Cambridge, Massachusetts: Harvard University Press, 2008. Larke-Walsh, George S. (2010). Screening the Mafia: Masculinity, Ethnicity and Mobsters From 'The Godfather' to 'The Sopranos'. Jefferson, N.C.: McFarland & Co. ISBN 9780786456130. Larson, Calvin J. and Garrett, Gerald R. Crime, Justice and Society. Walnut Creek, Calif.: Alta Mira, 2003. Shanty, Frank. Organized Crime: From Trafficking to Terrorism. Santa Barbara, Calif." ABC-CLIO, 2008. Thompson, William Norman. Gambling in America: An Encyclopedia of History, Issues, and Society. Santa Barbara, Calif.: ABC-CLIO, 2001. This page was last edited on 15 March 2019, at 02:51 (UTC).